Why Italian Mannerists like Rosso Fiorentino were painting’s first avant-garde. Henri Matisse is supposed to have encountered someone who complained that the arm of a woman in one of his portraits was too long. “Madam, you are mistaken,” he replied. “This is not a woman, this is a painting.” She might have replied, “That’s not an argument, that’s attitude.” The painter’s bon mot is what E.H. Gombrich (to whose classic study Art and Illusion I owe the anecdote) called “one of the paradoxes with which modern artists and critics like to tease the long-suffering public.” Such paradoxes can be hard to avoid. Gombrich thought the development of pictorial illusionism—that is, of the European canon of realistic representation—“was stimulated by the dissatisfaction which certain periods of Western civilization felt with images that failed to look convincing.” The statement is itself paradoxical, because it ignores the question of who wants to be convinced by an image. Long before Matisse, the Italian artists of the sixteenth century who came to be known as Mannerists were willing to twist their figures out of proportion, and they did so to create not convincing images, but convincing paintings. That such a project was untimely in the twentieth century, even for the cinema, is suggested by the fact that Pasolini was never able to make the film he planned (its screenplay has recently been published by Verso). Yet what Pasolini could only dream of, the painters of the High Renaissance had to some degree already done. By the time of Raphael and Leonardo, 200 years after Giotto, nothing seemed left to add: perspective, sfumato and other techniques sufficed to give a hitherto undreamt-of solidity, naturalness and presence to figures, as well as clarity to the spatial relations among them. All that remained was to apply this painstakingly gathered technical knowledge. The adventure of discovery was over. That might be reason enough for artists to grow restless. But the nature of faith, too, continued to change. Italy was the scene of almost constant war from the 1490s through the 1550s, and these wars were fueled by religion, which was then in an unheard-of state of flux. Even before Martin Luther’s ideas had begun to spread throughout Europe, Savonarola had castigated the Florentines for their decadence and declared Christ the king of Florence. These views first brought the zealous friar to power; then he was excommunicated and burned at the stake. In 1527, Habsburg troops sacked Rome. Living in early to mid-sixteenth-century Italy must have been more like living in twenty-first-century Syria or Iraq than in contemporary Europe—and amid such turbulence, how could art not reflect the loss of old certainties? The art that flourished in Italy in that period has come to be known as Mannerism, and from the seventeenth through the nineteenth centuries it was considered of no intrinsic interest, merely (as one art historian summarized it) “a servile, uncritical imitation of the manners of the great masters, and especially of the anatomical exaggerations of Michelangelo’s figure style.” In the twentieth century, parallels with aspects of modernism—those expressive distortions of the figure that, as Matisse would have it, turned the image of a woman into a painting—breathed new life into an art that had lain neglected for centuries. To eyes liberated from the old canons of realism, the Mannerists could be seen not as weak imitators but as true originals whose disproportionate emotional and intellectual demands on their own art made them seem uncannily contemporary: the American kids on their Fulbrights are crazy for them, Roberto Longhi was to note, with some condescension, in the 1950s. And yet even then, and still today, it would have been hard to argue that the great Italian art of the sixteenth century was Florentine Mannerism—not when the likes of Titian, Tintoretto and Paolo Veronese were flourishing in Venice, which despite certain setbacks was largely insulated from the warfare and religious upheaval common elsewhere in Italy. The Venetians, and especially Tintoretto, may at times show mild affinities with their central Italian contemporaries, but they never betray the anxiety and inner conflict we find among the Mannerists. Modernism having outlived its heyday, the craze for the Mannerists as its newly discovered precursor has subsided as well. 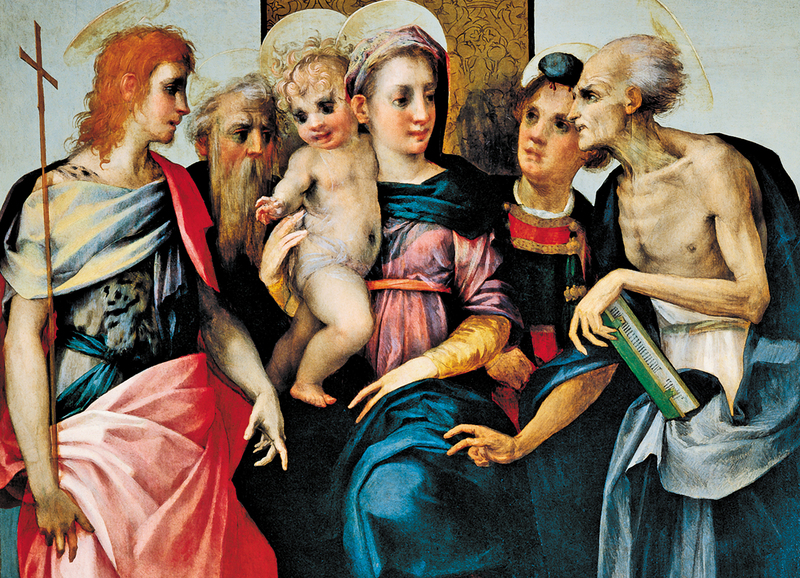 If you visit Florence this summer, you may find that ducking into the Palazzo Strozzi to see the remarkable exhibition “Pontormo and Rosso Fiorentino: Diverging Paths of Mannerism” (through July 20) is a great way to dodge the tourist crowds that choke the city’s streets. The works by these two Tuscans, who have good claim to being considered the originators of Mannerism, are as fascinating and problematic as ever. But chances are, if you’re inclined to look at them to discover affinities with art’s future, it’s not Matisse, German Expressionism or Giacometti you’ll think of first. At least I didn’t—what I saw, for better or worse, was a postmodern Mannerism: the invention of bad taste or, as Clement Greenberg used to call it, kitsch. What Greenberg couldn’t bear to admit was that his beloved avant-garde and his detested kitsch have something in common: both expose the inadequacy of established taste. Contrary to what Greenberg claimed in his famous 1939 essay “Avant-Garde and Kitsch,” modernism was always as beguiled by kitsch as repulsed by it. And it’s precisely because Mannerism flirts with bad taste that it can also be seen as the first avant-garde. It’s a curious thing, when you think about it: medieval art, even with its naïveté and grotesquery, is never kitsch; rather, there is an admixture of what might be called healthy popular taste with more refined elements. In the Renaissance, stricter stylistic canons came into force and the popular elements receded. A second-rate Renaissance painting is just bland, but there’s never anything trashy about it; at worst, you get the slightly queasy mix of materialistic trompe l’oeil and overstated emotionalism in some of Carlo Crivelli’s paintings (no wonder the Pre-Raphaelites liked him). But in general, the inherent restraint of quattrocento style kept these kitsch tendencies in check, and only rarely did Crivelli achieve anything like truly bad taste. Not so with Rosso Fiorentino, a far better painter than Crivelli ever was. Born Giovanni Battista di Jacopo in 1494, he took his nickname (“Florentine Red”) from his fiery hair and his hometown. Rosso offended established taste almost from the get-go. Vasari tells us that the young artist wouldn’t stay with any master, “having a certain opinion of his own that conflicted with their manners.” Commissioned in 1518 to paint an altarpiece, he invited the patron, Leonardo di Giovanni Buonafede, to view the work in progress; alas, “the Saints appeared to him like devils,” according to Vasari, and so “the patron fled from his house and would not have the picture, saying that the painter had cheated him.” The work, Madonna and Child With Four Saints, also known as the Spedalingo Altarpiece, was exiled to a small provincial church, where it slumbered until the nineteenth century; in 1900, it was admitted to the collection of the Uffizi and has now moved across town for the Palazzo Strozzi exhibition. As David Franklin writes in the catalog, the learned Carthusian who was so horrified by Rosso’s painting thus far “was a prolifically experienced if conservative patron of altarpieces” whose “reaction, although vehement, was well-informed.” Most demoniac in appearance is the harsh and wasted figure of St. Jerome on the right. Franklin suggests that the red-haired St. John on the left—the artist’s namesake, and the only one of the painting’s figures (aside from the infant Christ and the sweetly earnest cherubs at Mary’s feet) who doesn’t appear to be an emanation of the blue shadows swirling around the Madonna’s legs—is Rosso’s way of announcing that the painting was intended as his “impassioned personal contribution to the hothouse atmosphere of Florence in the first two decades of the 16th century.” I shouldn’t wonder. In any case, despite Vasari’s claim that it was all a misunderstanding and that Rosso intended to “sweeten the expressions” of the saints in the process of finishing the painting, they retain to this day the “savage and desperate air” that drove the poor churchman running from Rosso’s door. What I am calling “kitsch” is just that clutching at the viewer’s heartstrings, the sense of what Keats called a “palpable design” on the beholder. A fundamental uncertainty as to whether the artist and the viewer still form part of a community of faith creates a need to extort conviction when none might be forthcoming. But whatever is cringe-inducing in Rosso’s pictures is more or less inextricable from what sometimes makes them so breathtaking. Unfortunately, his great 1521 Deposition has not come to Florence from Volterra; as with any exhibition of Renaissance art, this one inevitably suffers from the fact that so many of what might have been the most important exhibits are immovable. In that work, the geometry of a massive cross becomes the armature for clusters of weirdly distorted bodies—geometricized yet weightless, as if they had been sculpted in Styrofoam—that arouse about as much credibility as Dalí’s soft watches, yet convey an anguish adequate to the painting’s subject precisely through this sense of dreamlike unreality. But perhaps more typical of the artist is a later Deposition that is on view here, dated 1527–28; the machinery of the setting practically disappears in a darkness that, according to Vasari, was intended to suggest “the eclipse that took place at Christ’s death,” but instead seems to convey the inability of the spectators, shown piling onto one another to partake of the agony of scene, to perceive it to their satisfaction. Amid the tumult and obscurity, one might fail to notice the mysterious animal-faced figure (he looks not unlike Jim Carrey as the Grinch) looking on from the background. A similar darkness and claustrophobic airlessness is at work in a much later Pietà that may be one of Rosso’s last works, given a date of around 1538–40. Pontormo, too, in his early paintings on religious themes, has a tendency to overload his subjects’ eyes with expressiveness—consider just the central Mary in the 1518 Sacra Conversazione (Pucci Altarpiece), not to mention the Christ child with the unfocused stoner’s gaze in the 1523–25 Madonna and Child With the Young St. John the Baptist—but not quite as heavy-handedly as his Florentine colleague. Born Jacopo Carucci in 1494 (the same year as Rosso), the painter’s alias refers to Pontorme, his hometown, near Empoli. Vasari characterizes him as an asocial eccentric who dressed shabbily, adding: “He would not work save when and for whom he pleased.” Like Rosso, Pontormo painted a Deposition that is sadly missing from the show at the Palazzo Strozzi, though it hangs nearby in Florence in the church of Santa Felícita. It is dated 1525–28 and, in contrast to the one painted a few years earlier by Rosso, it forgoes any geometrical structure whatsoever. It lacks the cross itself, and the ground on which the figures with their candy-colored draperies tread is not differentiated from the air; they all seem to float slowly around each other in a sort of torpid Brownian motion. The one anchor in something like reality is the foreground figure, who actually appears to bear the weight of the dead savior on his shoulder, though crouching in a position that makes this almost impossible. A similar weightlessness and placelessness can be seen in another famous painting of Pontormo’s on display at the Palazzo Strozzi, the Visitation of circa 1528–29. This sense of placelessness is all the more confounding in that the painting is given an outdoor setting with architecture—yet this is as unconvincing as a theatrical flat, and moreover entirely out of scale with the figures, who therefore appear as giantesses. Moreover, the figures of Mary and Elizabeth beginning to embrace each other in greeting are watched over by two women behind them who appear to be the same Mary and Elizabeth. We are presented not with the representation of a real event, but with the evocation of a spiritual state of being in which action and contemplation are at once split off from each other and confused. As if to prove the affinity between Mannerism and contemporary art, the Palazzo Strozzi is also presenting Bill Viola’s 1995 video installation The Greeting, which is based on Pontormo’s Visitation. This is one of Viola’s best works, but it employs the same device that makes so much of what he does unbearable: slow motion as a kind of expressive exaggeration. By slowing down an encounter that lasted forty-five seconds so that it stretches out to ten minutes, Viola turns what might have been a banal episode into a spectacle that feels freighted with unspecified significance. Just as the Mannerists—or modernists like Matisse—used spatial distortion, Viola uses temporal distortion to get his point across. Like the Mannerists—but unlike Matisse—Viola seems to do this in order to compel an attitude of piety toward what he is presenting that one might not otherwise be inclined to give. It’s not quite Keane’s saucer-eyed appeal for empathy, but it’s close enough to make me uneasy.